In old Okinawa, the nobles taught their sons karate because it would teach them to become noble, an objective reached by a few means. The tough physical training developed self-discipline, focus, courage, and spirit. Forever being short on both knowledge and physical prowess to one’s instructor, developed continued humility and kept over-ego at bay. Constantly aiming to perfect technique, developed habits of commitment to excellence that could be carried into all facets of life. Even from a self-defense aspect, a boy well trained in fighting would have nothing to prove and therefore resist resorting to his fists to end an argument. This would develop negotiation, empathy and reasoning skills, each one an important attribute to a nobleman. Today, thousands of parents from around the world enroll their children in martial arts with an identical goal in mind; that it will develop their children’s character so they grow into noble men and women. So how then can one establish as to whether karate training is shaping their character? 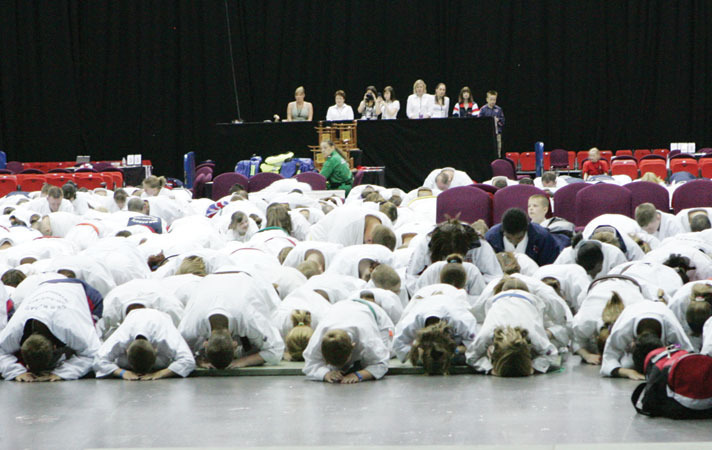 Simply by observing training habits for karate is a character in action. The Meticulous: Some students are very meticulous in their Kata. Their primary concern is that every technique is neat and follows the perfect path. When practising kata they tend to ask the most questions and while this is admirable, they often compromise their focus on power, speed and kime. If kata is character in action, it suggests these students take the same approach to life; they get ideas, make detailed plans, dot every ‘i’ and cross every ‘t’ but fall short for a simple reason – they fail to take immediate action, massive action and put some ‘gusto’ into it. In their kata they often stop and look down to check their stance, ensuring it’s perfect instead of completing the kata without distraction (mistakes and all). Similarly, in their life, every obstacle they meet finds them wanting to stop and assess everything all over again, bringing a stop to any momentum gained. Kata And Life Require Balance: In both kata and life, the key is balance. If we are too focused on perfect planning, and on everything running smoothly and precisely, our kata will not flow or appear ‘real life’ effective. In our life, our meticulous planning will find we rarely start on our ideas or stop too often once we do start. In contrast, if we are all gung-ho, ‘work hard, focused’, our kata will lack technique. Similarly, while we find ourselves taking massive action on our ideas, we instigate bad habits, which find us working hard, but without productivity. Problematic of most peoples attitudes is that they take on the ‘that’s the way I am’ approach. They might sum themselves with affirmations as, “I like to know all the details before I do something,” “I just don’t have the gusto in me,” “I just like to get in there and do it, I don’t think too much.” When we categorise ourselves, we instantly forget we have the ability to change at any moment we choose. When we understand how kata and life go hand in hand, we have more credence to promote change within ourselves. If you’re too meticulous, remind yourself that you need to practise and that action is as important as knowledge, and vice versa. As an example, let’s say we have a student who practises his or her attacking kumite drills and this in turn develops self-confidence. To some degree, this alone is pivotal to life success; that is, through proper preparation (practise) we develop the confidence to go after our goals. The student in question now begins kumite with high expectation and after their first attack something happens…. perhaps they are picked off, counter attacked, or worse – contacted. Their confidence takes hit and on their next attack, they half commit, making it even easier for their opponent to pick them off. Suddenly their world comes crashing down and all confidence abandons them. What follows is a few minutes of either standing still and doing nothing or running away. What happened to that confidence and conviction gained through preparation? It was overcome by a focus on fear, self-doubt and losing. What attitude do you have in kumite? Do you find yourself giving in early on if an opponent gets the first few techniques in? Do you find yourself hiding away if someone makes slight contact on you? If you do, don’t dismiss it as kumite, saying “I’m not a kumite person” is not a reasonable excuse because kumite is character in action, so what is it saying about your character? This is a common scenario and once again is a reflection of ones character. The world is full of people who had a goal, prepared, gained confidence, committed once and then after a rejection or setback, gave in. Perhaps they applied for a job or two and were told they did not have enough experience or that no one was hiring at that point in time. What happens? Next time they put in less time to their application letter and if they get an interview, less time into their interview preparation – their reasoning, they probably won’t get the job anyway. This if course sees them fail as expected and a person who was once optimistic is now pessimistic. In Life And Kumite, You’ve Got To Be Prepared To Take The Hits: In every area of your life, for your entire life, you are going to take some hits: rejection, setbacks, disappointment, temporary failure, people who let you down and even use you. When you allow these hits to beat you down, you give up from future endeavour, or to fail to commit 100%, or develop pessimism – then you are setting yourself up for a life of misery. It is not human nature to run into adversity, so during kumite, I always remind myself, “I’m happy to get hit.” In kumite, I know I cannot win every confrontation. This means that there will be times I get picked off, or even contacted. But again, I remind myself, “I don’t have to win every confrontation and I’m happy to take the hits.” Only when we take this attitude are we able to keep our focus on our preparation, on our skill sets and away from fear and pessimism. You have to get in there and keep trying, never giving up. Losing 50 encounters does not mean the 51st encounter will also see you losing, unless you drop in commitment or give up. The same way that getting 50 job rejections does not mean the 51st will also equal rejection – unless you drop in your interview preparation commitment. You have to get in there and be prepared to take the hits and the losses, and when you get them, don’t focus on fear, focus on doing it with the same commitment but better technique. That’s right, focus on how you can do it better next time! And when you do and fail again, learn from it and try again, even better! Ask yourself: Do you come up in sumo stance early? If you do, now ask yourself, do you tend to become discouraged or want to quit at first sign of difficulty in life? Ask yourself; do you tend to blame your sensei when you’re held back from a grading? Chances are you blame others when things are not going well in your life. Ask yourself; do you become frustrated when others around you progress faster than you? Chances are you find frustration in life by comparing yourself unfairly to others. Everything in karate is a reflection of our character and every training habit we develop is telling us something either positive or negative about our character. So next time your training, wether its basics, kata or kumite, take the time to think about the character you’re demonstrating. If it’s not favourable, remember humans have the power to change anything in their life with a single decision.